If it's your profession to deal with wood, or perhaps you're just an occasional scroll saw user, then you might think that every scroll saw on the market is the same. However, it's not that way because there are different types of scroll saw blades, and they differ in quality and how they deal with wood. Looking at all the scroll saw blades on the market, you might be confused as to what you should pick so your hard-earned cash won't go to waste. If this is your first time picking out a blade for a scroll saw, then perhaps you might just put down the woodworking machine and just go back to your regular handsaw as it might be too much of a hassle for you to look through every model on the market. But an even bigger dilemma is having to deal with hand-sawing each piece of wood that comes your way. As a result, you'll have taken more time in just sawing off a piece of wood as opposed to letting the scroll saw and its blade do the work for you. Not only that, but you'll also have to deal with delayed onset muscle soreness (DOMS) if you always saw wood by hand day in and day out. When your muscles ache, then the quality of work gets diminished. If you find it taxing to search for the best scroll saw blades on the market, then search no further as we have a guide that's prepared just for you. I have a lot of wood to go through each day because it's my job, but it's also my passion. Many times I have to rely on my handsaw to get the job done, and for the most part, it can handle a lot of wood in a single day. Still, the number of wood I need to saw off increases as the business keeps growing. With the growth in demand, I knew I had to find something to help me get through with the day's work without having to disappoint clients. It was then when a friend of mine introduced me to scroll saws with a reliable scroll saw blade. When I looked at the price for these things, I was skeptical at first because I was scared of losing hard-earned cash on something I'm not familiar with. When I did try it, I was surely surprised by how it was able to handle hardwood like a hot knife passing through butter. Not to mention it can handle curves well, which is not something a traditional handsaw is proud of doing. I only wished that I knew about scroll saws and scroll saw blades sooner, and I also desired that I wasn't too skeptical about the idea. If I was able to change my mind before, I could only imagine how much woodwork I can get through for each day. Even though the market is now saturated with scroll saw blades, there are some that do come out on top. Take the Olson Saw PG49802 as a prime example; this scroll saw blade has sharp and quick-cutting teeth which can make fast work for many types of wood. It is even advertised to be the "most accurate scroll saw blade" to be ever made, and that might not even be such a tall claim. It can handle pointed corners, rounded edges, and it can create delicate shapes with a reliable scroll saw. It even has a double tooth design to make quick work of hardwoods. The Dremel MS50 Scroll Saw is unlike many other similar saws on the market, primarily because it has a pin-end blade design. It allows users to take charge of the ability to tighten and change blades quickly without having to use a separate tool. Its metal edge can let you create both curved and straight cuts to soft and hardwoods alike. It even allows you to choose the direction of the cut as it can create cuts from either Left-to-right or right-to-left. Perhaps one of the best factors to consider when looking at this particular model is its price, as it will let you save your hard-earned cash. Like many other scroll saw blades on the market, especially new models, the Olson Saw FR49501 delivers a design that is both simple to install and easy to handle. It is a durable blade and can make quick work with soft or hardwoods. It can even be used to cut plastic. Still, it is only compatible for saws that are compatible with 5 inch pinned blades. Just remember that you don't put too much tension on your saw as it can damage these scroll saws. If you want to make them last for a good long while, then don't tighten the tension too much. The scroll saw is an electrically-powered machine that can cut interior cutouts in wood and other materials. With a reliable scroll saw blade, cutting wood, plastic, or other items can be made an easier task to handle as opposed to using a regular handsaw. Think about this - if you use the traditional handsaw to cut complex objects that have rounded corners or complicated designs, then you're not going to get very far. Handsaws are reliable for a lot of woodworking projects, but it's not going to be as dependable as a good scroll saw, and an equally capable (or better) scroll saw blade. With a trusty scroll saw blade, you can make those curves and pointy corners with ease. It is ideal for woodworkers who are creating small and/or intricate designs on wood or other materials. With the right scroll saw blade, cuts will be smooth enough that no sanding is required. As such, work time can be cut (no pun intended). There are two major types of scroll saw blades that you need to consider before pulling out money from your wallet, and these are pin-end and plain-end models. Older scroll saws would often make use of pin-end blades whereas modern saws take advantage of plain-end variants. You should also consider what type of material you're about to cut. All scroll saw blades that are made from steel banks would usually have their durability hardened and then tempered. Therefore, these blades have the ability to cut most wood, albeit they do have different qualities which can affect results. There are also varying sizes for scroll saw blades on the market. The measurement determines its compatibility when cutting different materials. You should take note of a blade's measurements before purchasing them. Do some research first, as it might very well affect the outcome of your project. Another determinant to examine is the intricacy of the scroll saw pattern. Generally speaking, intricate designs will require saw blades that have small teeth. Larger blades can cut thicker objects, but they do have a tendency to have difficulty in cutting tight corners. Even if the material to cut may be thick and rugged, the blade you'll purchase should be small enough to cut the right angles for the corners of your preferred patterns without giving you too much trouble. The Olson Saw FR49501 are pin-end scroll saw blades that provide ease of use for the user. It can be installed to compatible scroll saws easily, and it also promotes ease of handling. It can handle tight and round corners pretty well, and it can cut through hard and soft woods. These blades can also be utilized to cut plastic. The blades in the FR49501 package are only compatible for scroll saws that can handle 5-inch pinned blades. The standard packaging contains six pieces of each FR42401, SC31201, and SC41101 blades. With these blades, cutting intricate patterns out of wood or plastic can now be a simple task to deal with. 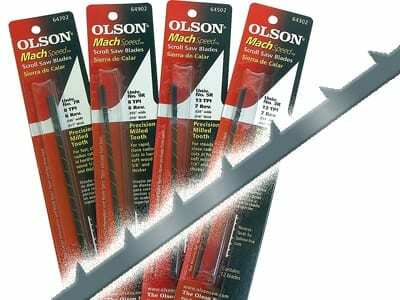 Unlike other low-quality scroll saw blades on the market, this product by Olson Saw provides ease of installation. It also comes with ease of handling, so users don't have to fidget around a lot just to get the saw in the right slot. They will also stay in place if properly installed. The Olson Saw FR9501 scroll saw blades are known for their accurate cutting prowess. It will give you the results you want as it can create smoothly rounded and sharp-cornered cuts. The blades are also made with high-quality material, so they won't bend or break easily, even during operation. The moment that you receive the Olson Saw FR49501 scroll saw blade set, you might be thrilled to attach it immediately to your scroll saw. You'll also notice that attaching it to the machine is a simple task to behold and will not take a lot of your valuable time. You might notice, however, that the blades might get damaged even after just about 20 minutes of use. The problem lies in the operator as most beginner users of scroll saws tend to put too much tension on their scroll saw blades. These blades are thin but still have a decent level of quality in them. Nonetheless, don't put too much tension on them and they should last longer. The Olson Saw PG49802 are a set of precision ground scroll saw blades that are being advertised with the "sharpest, fastest cutting teeth." Albeit it is such a tall claim, it can still perform quite admirably in different types of materials, especially when it comes to cutting wood and plastic. It is also made with durable material as it can last longer than many other scroll saw blade models on the market. These blades have a double-tooth design for doing quick work in sawing off intricate patterns on wood. There are no extra features on this variant, but perhaps it doesn't need to have extra features. Its simplicity is what makes it a great set of scroll saw blades. The teeth of the Olson Saw PG49802 scroll saw blades are incredibly sharp as they are made with "aggressiveness" in mind. It is even advised to wear a type of protective gear if you're planning to install or change the blades from your scroll saws to avoid accidents. Nonetheless, it also means that it can make quick, accurate, and smooth cuts for soft and hardwoods. These scroll saw blades are made of high-quality material. As such, they won't bend or break, even during operation. It also means that they are easy to install and to remove from your scroll saw. Durable. The blades won't bend, distort, or break during operation. Easy to install and to change. It makes quick work for cuts. The Olson Saw PG49802 offers a double-tooth design that can be reversed for fast cutting action in both directions. As such, you can maneuver your scroll saws from Left-to-right or right-to-left without having too much to worry. Due to its design, it can make quick and accurate work for tight cuts and corners. These blades are also highly durable and stiff, and they don't bend or distort during operation. 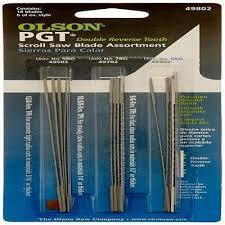 These Olson Scroll Saw Blades can do quick work in cutting intricate designs on hard and soft wood. It can also cut from materials that that are from 3/4 inch to 2 inches thick. The blades in the package contain seven teeth per inch, and it has a total width of .08 inches with each blade having a thickness of .018 inches. Furthermore, these scroll saw blades have a flat end and are not pin-end models. As such, they require a compatible scroll saw to make them work. Because of its .08 inch width, it has the right amount of stiffness when tackling thick pieces of wood and other materials. Furthermore, because of its blades having .018 inches in thickness, they have a relatively thin kerf. This special scroll saw blades have seven teeth-per-inch per blade, and they also have an extra wide gullet. With these features, they can make quick cutting work for hard and soft types of wood. These blades can also cut multi-layered materials from 3/4 inches to 2 inches in thickness. These blades don't just appear durable, but they also perform the part. They are made with a top-notch quality material to ensure long life. They also don't distort or bend during operation. It can handle cutting different types of wood, including walnut, oak, cherry, and maple. The blades tend to cut roughly because of their small TPIs. The Olson Scroll Saw Blades are advertised to cut through thick pieces of wood with minimal effort and hassle, and it does that and more. The blades are made with hardened and tempered material so it can last a long time (with proper cleaning, maintenance, and storage of course). It is an excellent partner to have if you need to tackle cutting into soft or hardwood, or other materials that have a thickness of 3/4 inch to 2 inches. Before anything else, know that the Dremel MS50 has a pin-end design, and it is compatible with the moto-saw. Its design grants users the ability to tighten and change the blades with minimal hassle. Furthermore, you don't need a tool to modify or tighten the blades either. These blades are also sharp enough to do quick work in cutting straight and curved patterns. Its design also allows cutting from the left to the right, or from right to left. Aside from its supreme cutting prowess, these blades are incredibly cheap. You might be skeptical about how they can work or if they're durable to withstand heavy loads because of its small price tag, but these models can take care of many of your wooden projects with ease and for a good long while as well. The Dremel MS50 makes use of a unique pin-head design which means you can tighten and change the blades without too much hassle. It also means that they are only compatible with scroll saws that accept pin-head scroll saw blades. Furthermore, due to the design of the blades, you can cut in either right-to-left or left-to-right directions. These blades are very sharp as they can make quick work of cutting different intricate patterns. They have the ability to make smooth cuts in either a straight or curved fashion. The resulting cuts when these blades are used are smooth and precise. Albeit the Dremel MS50 has a unique design and can only be used with a subtle number of scroll saws on the market, those who have these saws can make use of an admirable set of scroll saw blades. These models bring versatility, durability, sharpness, and overall excellent value for money. Still, some users do report a bit of difficulty in using these blades due to it not having a fence. The Pegas Swiss Made Saw Blades can cut a broad range of materials which include nonferrous and ferrous materials. The blades have a .02 inch thickness with a .094 inch width. It should be known right off the bat that these blades are mainly used to cut Dovetails. These blades can make precise work for intricate patterns, especially Dovetails. Their tension is superb, and these might even be the best scroll saw blades for that purpose mentioned above you can purchase. You can cut numerous amounts of round corners daily, and these will get the job done right each time. The Pegas Swiss Made Scroll Saw Blades can cut a broad range of materials. It can cut ferrous and nonferrous materials that have, at most, a .02 inch in thickness and a .094 inch width. Despite the fact that these blades are mainly used for cutting Dovetails, they can still do an admirable job with the task that is required of them. These blades are made of high-quality steel. As such, they can cut a lot of your wooden projects for a long time (provided proper cleanliness, storage, and maintenance are still followed). As an added perk, these blades won't put much of a dent in your spending allowance. Using the Pegas Swiss Made Pinned Saw Blades will make quick work for Dovetails. The blades are thin enough that it can produce really thin kerfs. To give you an idea on its "thickness," they have a .02 inch thickness, which means that it can fit in a kerf cut made by .015 inch saw with any teeth design. Make no mistake, the teeth on these blades are incredibly sharp despite their thin architecture. They can produce remarkably smooth cuts, and you can make use of them for the entire day without worry of any breaking or bending to occur. When you look at the market of scroll saw blades, I was surprised by the sheer number of them that are all available for purchase. Even when I search for reliable scroll saw blades, my search might be more specific this time around, but there's still dozens of them to go through. One reviewer even mentioned that these are "very nice scrolling blades." They do provide excellent quality and smooth finishes to many pieces of both hard and soft kinds of wood. However, not all reviews point to the positives, as one reviewer said that the blades were sent to him in separate packages and he had to take extra effort to figure out which of the blades are for what purpose. Nevertheless, it is a breath of fresh air to know that the negative reviews don't point out to the product itself but with the shipper of the package. What makes the Olson Saw SP46500 is it can saw in all directions. Unlike the traditional scroll saw blade design, this particular variant has a 360-degree cutting capability. It can do quick work with cutting wood and other materials, but the speed in achieving a desirable finish does depend on the material's thickness. The blade is made out of high-quality carbon steel, which is hardened and then tempered to make for a long lifespan. If you're a beginner in using a scroll saw, then the Olson Saw FR49400 Assorted Scroll Saw Blades ought to tickle your fancy. It provides excellent cutting prowess and can let you deal with cutting intricate patterns without much of a hassle. The blades found in the package are the Universal No. 2 - 20 TPI, Universal No. 5 - 12.5 TPI, and the Universal No. 7 - 11.5 TPI blades. 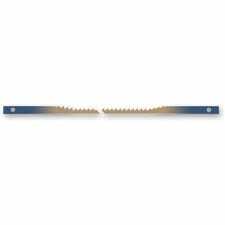 These blades can cut in a quick manner, and they can provide excellent chip clearance as well. If you're working with really delicate projects such as 1/8 inch wood panels, then you can make use of the Olson Saw SP46300. This particular model can make patterns on soft and hardwood with ease. However, there is a caveat to using this blade, and it is due to it being an aggressive tool. In other words, whenever you're using this, it will kick up a lot of sawdust and sand in the immediate area. As such, you might want to keep a broom handy at all times if you decide on using this variant. The Olson Saw Fr49604 contains 12 each of reverse, spiral, and skip blades. These blades have a reverse tooth design for fast, smooth, and splinter-free cuts on both top and bottom surfaces. These blades are excellent partners to have in your woodworking bench as it can help eliminate tear-out on particular types of wood, especially maple plywood and birch. However, do be careful when handling these blades because they are extremely sharp. It is advised to wear protective gear when changing or removing them from your scroll saws to prevent accidents. 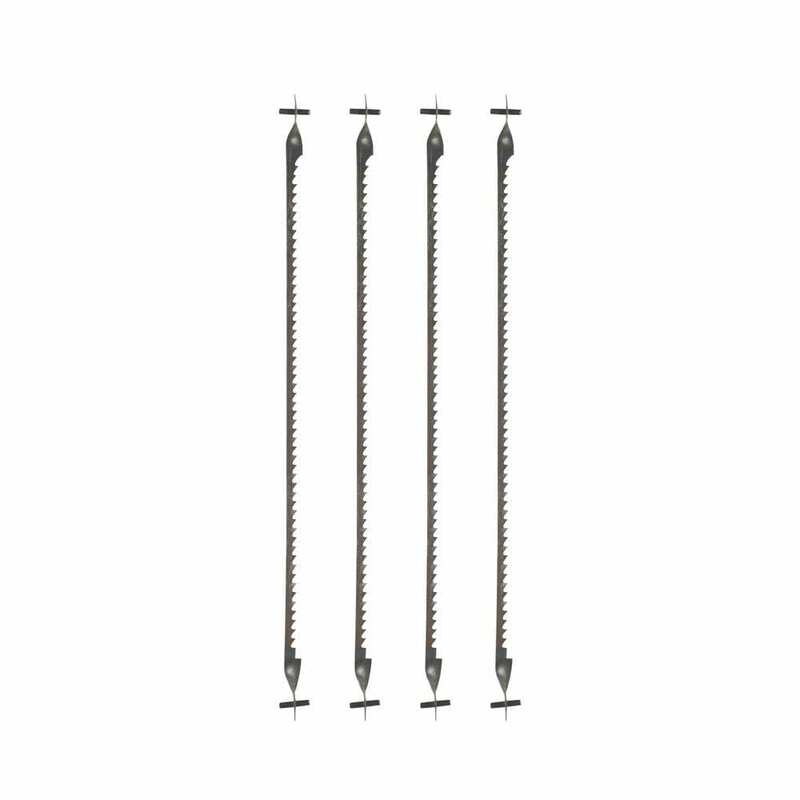 The Proxxon 28745 are pin-end scroll saw blades that have a length of 5 inches. The standard packaging lets you take advantage of 12 of these blades right off the bat. These blades are made of high-quality steel, so durability is not much of a problem. Also, they are designed to cut non-ferrous metals, reinforced plastics, plastics, glass fibers, Plexiglas, and, of course, different types of wood. Each blade has 25 TPI (teeth per inch) to create smooth finishes. One look at the Bosch SS5-28PL and you might be amazed by how thin these blades are made. Each of the blades in the package is made out of premium-grade steel to promote a longer life. These are all made with precision sharpening techniques to allow ease-of-cutting for just about any intricate shape. It is recommended to use these blades when sawing hard and soft woods, as well as with plastics and non-ferrous metals. If you have to deal with intricate patterns and cuts on wood and other objects, then having a set of scroll saw blades should be your top priority the next time you browse the market (and especially if you already have a scroll saw). Don't even think about cutting complicated patterns with a handsaw because you're just going to have a tough time with the task. The Olson Saw PG49802 Precision Ground Scroll Saw Blade is a good set of blades to start with, especially if accuracy in cutting is your prime factor in choosing a reliable scroll saw blade. With this blade, you don't have to scratch your head in wonder as to how you're going to go about cutting smooth and precise cuts on wood, plastic, or non-ferrous metals. If you want to view the product, you can go ahead and click here.